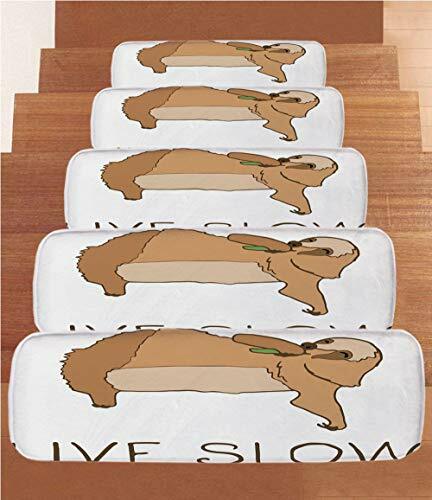 iPrint Non-Slip Carpets Stair Treads,Sloth,Relaxed Happy Animal Lying and Eating Cute Character Live Slow Motivational Phrase Decorative,Light Brown,(Set of 5) 8.6"x27.5"
Clean with warm water and mild soap, hang or lay flat to dry, no tumble dry or iron. Provides maximum grip by its anti-slip sticker, and protects you and your stairs. onto your stairs to help protect the surface and create additional traction. 1.If you have any problem/question with this Carpets Stair Treads, please do not hesitate to contact us and we will endeavor to solve it to your satisfaction! 2.With the different in the measurment methods,please allow1-2cm in size deviation. 3.There might be slightly difference in color,because of the computer monitor setting. Security: Secure Non Slip Stair Treads - Contains a durable rubber backing that helps prevent slipping or sliding of the rug and holds rug into place. Perfect to prevent small children and pets from falling or slipping on stairs.For additional security you may also use double-sided tape or carpet tacks (carpet tacks not included). iPrint Non-Slip Carpets Stair Treads,Tribal,Ethnic Warrior Wolf Portrait with Mask Feathers Native American Animal Art,Teal White and Red,(Set of 5) 8.6"x27.5"
iPrint Non-Slip Carpets Stair Treads,Kids,Colorful Jungle Animals Hippo Bat Parrot Giraffe Zebra Rhino Panda African Safari Themed Decorations Decorative,(Set of 5) 8.6"x27.5"
Non-Slip Carpets Stair Treads,Zoo,Forest Scene with Different Animals Habitat Jungle Tropical Environment Kids Cartoon Decorative,Multicolor,(Set of 5) 8.6"x27.5"
iPrint Non-Slip Carpets Stair Treads,Coffee Art,Friendly Animal Jumping Dog Watercolor Splatters Coffee Drop Art,Burnt Sienna Black White,(Set of 5) 8.6"x27.5"
iPrint Non-Slip Carpets Stair Treads,Winter,Seasonal Conceptual Artwork Purple Trees Snowy Weather Cute Bird Animal Decorative,Dust Purple Orange,(Set of 5) 8.6"x27.5"
Non-Slip Carpets Stair Treads,Primitive,African Safari Patterns Cheetah Skin Print Animal Theme Neutral Color Decoration,Brown Beige,(Set of 5) 8.6"x27.5"
iPrint Non-Slip Carpets Stair Treads,Yorkie,Realistic Computer Drawn Image of Yorkshire Terrier with Cute Ribbon Animal Decorative,Salmon Light Brown,(Set of 5) 8.6"x27.5"
Non-Slip Carpets Stair Treads,Christmas Decorations,Cute Owl Family Sitting on Branch Like Little Elves of Noel Animal Design,Multi,(Set of 5) 8.6"x27.5"
iPrint Non-Slip Carpets Stair Treads,Fish,Asian Inspired Geometric Aquarium Animal Geometric Pattern Cartoon Style Decorative,Slate and Cadet Blue Tan,(Set of 5) 8.6"x27.5"